There are 44 Assisted Living Facilities in the Portsmouth area, with 7 in Portsmouth and 37 nearby. The average cost of assisted living in Portsmouth is $3,745 per month. This is higher than the national median of $3,346. Cheaper nearby regions include Hampton with an average starting cost of $2,544. To help you with your search, browse the 255 reviews below for assisted living facilities in Portsmouth. On average, consumers rate assisted living in Portsmouth 3.6 out of 5 stars. Better rated regions include Norfolk with an average rating of 4.0 out of 5 stars. Caring.com has helped thousands of families find high-quality senior care. To speak with one of our Family Advisors about assisted living options and costs in Portsmouth, call (855) 863-8283. Portsmouth sits on the Elizabeth River across from Norfolk and is close to several other cities, offering residents quick access to popular destinations, like Virginia Beach. The area can be an attractive option for seniors who enjoy waterfront environments and ships. After all, Portsmouth is home to the Norfolk Naval Shipyard. Portsmouth offers seven assisted living facilities, and 56 more are located in nearby areas, such as Chesapeake. At least four individuals live in each facility and receive some degree of assistance with at least one activity of daily living, such as eating or dressing. The Virginia Department of Social Services regulates these facilities. Portsmouth can be a pleasant place to live, as it scores 71 out of 100 on Sperling’s comfort index. It offers an above-average number of sunny days and below-average figures for snow, making it suitable for plenty of outdoor activity. The crime rate might give seniors pause. While the U.S. average for property crime is 38.1 on a scale of 100, the Portsmouth average is 65.1. The city's violent crime rate ranks about 18 points higher than the U.S. average as well. The cost of living in Portsmouth makes the city one of the more affordable areas in Virginia. Living in Portsmouth costs 8 percent lower than the U.S. average and 15 percent lower than the state average. However, health care, utilities and miscellaneous expenses are slightly above the national average. The Virginia Beach-Norfolk area, which includes Portsmouth, earns decent air quality numbers, according to the American Lung Association. It is one of the cleanest areas in the country for 24-hour particle pollution and ranks 122 out of 227 metropolitan areas for high ozone days. The area may be a good option for seniors with respiratory concerns. Hampton Roads Transit provides public transportation in Portsmouth and nearby cities, such as Norfolk, via bus, ferry and light rail. Seniors 65 and older get discounted rates. Norfolk International Airport is about 10 minutes away from Portsmouth and offers flights to diverse U.S. and international destinations. Portsmouth has a range of arts and cultural opportunities for senior outings, including the Portsmouth Art & Cultural Center, the Commodore Theatre and the Visual Arts Center at Tidewater Community College. Assisted Living costs in Portsmouth start around $3,745 per month on average, while the nationwide average cost of assisted living is $4,000 per month, according to the latest figures from Genworth’s Cost of Care Survey. It’s important to note that assisted living rates in Portsmouth and the surrounding suburbs can vary widely based on factors such as location, the level of care needed, apartment size and the types of amenities offered at each community. Portsmouth residents may qualify for an auxiliary grant to help with assisted living, especially if they receive SSI. Seniors may also be eligible for the CCC Plus Waiver, which helps fund agency-directed personal care services. Portsmouth and the surrounding area are home to numerous government agencies and non-profit organizations offering help for seniors searching for or currently residing in an assisted living community. These organizations can also provide assistance in a number of other eldercare services such as geriatric care management, elder law advice, estate planning, finding home care and health and wellness programs. To see a list of free assisted living resources in Portsmouth, please visit our Assisted Living in Virginia page. 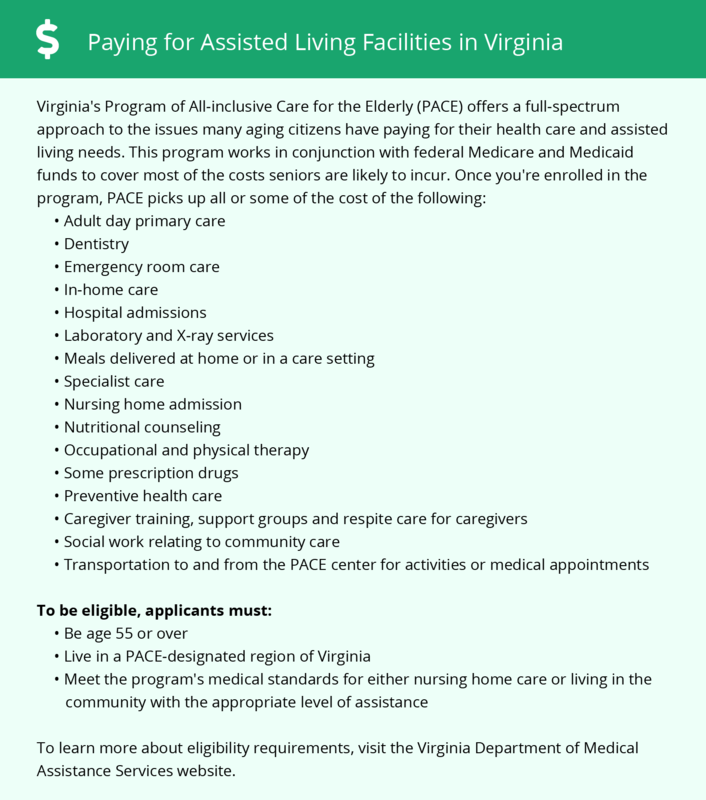 Portsmouth-area assisted living communities must adhere to the comprehensive set of state laws and regulations that all assisted living communities in Virginia are required to follow. Visit our Assisted Living in Virginia page for more information about these laws.